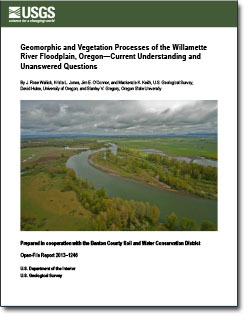 This report summarizes the current understanding of floodplain processes and landforms for the Willamette River and its major tributaries. The area of focus encompasses the main stem Willamette River above Newberg and the portions of the Coast Fork Willamette, Middle Fork Willamette, McKenzie, and North, South and main stem Santiam Rivers downstream of U.S. Army Corps of Engineers dams. These reaches constitute a large portion of the alluvial, salmon-bearing rivers in the Willamette Basin. The geomorphic, or historical, floodplain of these rivers has two zones - the active channel where coarse sediment is mobilized and transported during annual flooding and overbank areas where fine sediment is deposited during higher magnitude floods. Historically, characteristics of the rivers and geomorphic floodplain (including longitudinal patterns in channel complexity and the abundance of side channels, islands and gravel bars) were controlled by the interactions between floods and the transport of coarse sediment and large wood. Local channel responses to these interactions were then shaped by geologic features like bedrock outcrops and variations in channel slope. Over the last 150 years, floods and the transport of coarse sediment and large wood have been substantially reduced in the basin. With dam regulation, nearly all peak flows are now confined to the main channels. Large floods (greater than 10-year recurrence interval prior to basinwide flow regulation) have been largely eliminated. Also, the magnitude and frequency of small floods (events that formerly recurred every 2–10 years) have decreased substantially. The large dams trap an estimated 50–60 percent of bed-material sediment—the building block of active channel habitats—that historically entered the Willamette River. They also trap more than 80 percent of the estimated bed material in the lower South Santiam River and Middle and Coast Forks of the Willamette River. Downstream, revetments further decrease bed-material supply by an unknown amount because they limit bank erosion and entrainment of stored sediment. The rivers, geomorphic floodplain, and vegetation within the study area have changed noticeably in response to the alterations in floods and coarse sediment and wood transport. Widespread decreases have occurred in the rates of meander migration and avulsions and the number and diversity of landforms such as gravel bars, islands, and side channels. Dynamic and, in some cases, multi-thread river segments have become stable, single-thread channels. Preliminary observations suggest that forest area has increased within the active channel, further reducing the area of unvegetated gravel bars. Alterations to floods and sediment transport and ongoing channel, floodplain, and vegetation responses result in a modern Willamette River Basin. Here, the floodplain influenced by the modern flow and sediment regimes, or the functional floodplain, is narrower and inset with the broader and older geomorphic floodplain. The functional floodplain is flanked by higher elevation relict floodplain features that are no longer inundated by modern floods. The corridor of present- day active channel surfaces is narrower, enabling riparian vegetation to establish on formerly active gravel bar surfaces. The modern Willamette River Basin with its fundamental changes in the flood, sediment transport, and large wood regimes has implications for future habitat conditions. System-wide future trends probably include narrower floodplains and a lower diversity of landforms and habitats along the Willamette River and its major tributaries compared to historical patterns and today. Furthermore, specific conditions and future trends will probably vary between geologically stable, anthropogenically stable, and dynamic reaches. The middle and lower segments of the Willamette River are geologically stable, whereas the South Santiam and Middle Fork Willamette Rivers were historically dynamic, but are now largely stable in response to flow regulation and revetment construction. The upper Willamette and North Santiam Rivers retain some dynamic characteristics, and provide the greatest diversity of aquatic and riparian habitats under the current flow and sediment regime. The McKenzie River has some areas that are more dynamic, whereas other sections are stable due to geology or revetments. Historical reductions in channel dynamism also have implications for ongoing and future recruitment and succession of floodplain forests. For instance, the succession of native plants like black cottonwood is currently limited by (1) fewer low-elevation gravel bars for stand initiation; (2) altered streamflow during seed release, germination, and stand initiation; (3) competition from introduced plant species; and (4) frequent erosion of young vegetation in some locations because scouring flows are concentrated within a narrow channel corridor. What is the distribution and diversity of landforms and habitats along the Willamette River and its tributaries? What is the extent of today’s functional floodplain—the part of the river corridor actively formed and modified by fluvial processes? How are landforms and habitats in the Willamette River Basin created and sustained by present-day flow and sediment conditions? How is the succession of native floodplain vegetation shaped by present-day flow and sediment conditions? Answering these questions will produce baseline data on the current distributions of landforms and habitats (question 1), the extent of the functional floodplain (question 2), and the effects of modern flow and sediment regimes on future floodplain landforms, habitats, and vegetation succession (questions 3 and 4). Addressing questions 1 and 2 is a logical next step because they underlie questions 3 and 4. Addressing these four questions would better characterize the modern Willamette Basin and help in implementing and setting realistic targets for ongoing management strategies, demonstrating their effectiveness at the site and basin scales, and anticipating future trends and conditions. Wallick, J.R., Jones, K.L. O’Connor, J.E., Keith, M.K., Hulse, David, and Gregory, S.V., 2013, Geomorphic and vegetation processes of the Willamette River floodplain, Oregon—Current understanding and unanswered questions: U.S. Geological Survey Open-File Report 2013-1246., 70 p., http://dx.doi.org/10.3133/ofr20131246.